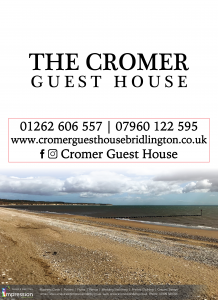 Alison and Jason welcome you to The Cromer Guest House Bridlington. Situated 200 yards from the north beach and 300 yards from the town centre, it is a great base for exploring the Yorkshire countryside and coastline. We serve a hearty full English breakfast including ample fresh tea or coffee and hot toast, fruit juices and a selection of breakfast cereals. There is a Freeview flat-screen TV in each room and WiFi Internet. We are working hard to ensure you enjoy your stay – that’s why so many guests return time after time! We have a variety of accommodation, including an assortment of Super King, double, twin or family rooms. All rooms are styled to a modern design with furniture to suit, a real home from home. We are always happy to help, to ensure we make your stay special, from always greeting you with a smile, collecting you from the train station if you need us to, providing a free car parking permit and generally going above and beyond. Please take a look around this site and our Facebook page and contact us on 01262 606557 if you have any questions. You can check your accommodation availability either by phoning on the number above or book online by clicking here or by following the Freetobook links. We are always happy to help with vegetarian and other special dietary needs (please notify us in advance). To Book Online please just click here. Phone 01262 606557 for booking information.